Welcome! We are the largest South Florida distributor of Titan Tankless Water Heaters and are an authorized Titan Tankless distributor for almost 20 years. We have been selling on Ebay for over 18 years with over 3000 great feedback's. We offer the best prices, return policy and shipping on Ebay. We value and take care of our customers. 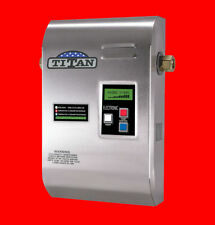 The Titan Tankless Water heater has been manufactured in the USA for over 33 years. 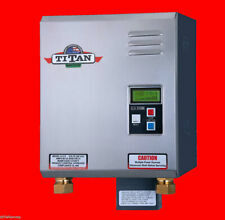 A Titan Tankless will replace your entire homes hot water heater system, while saving up to 60% on energy, and you can create up to 21 cubic feet of new storage as the Titan is wall mounted with no venting and uses no floor space. In addition the hot water never runs out, it is endless so if you have guests you can take 10 showers in a row and never run out of hot water. This is the modern way to heat your water in your home, go with the Titan Tankless. Please contact us if you have any questions and thank you for visiting our store.